300sl gullwing barnfind. 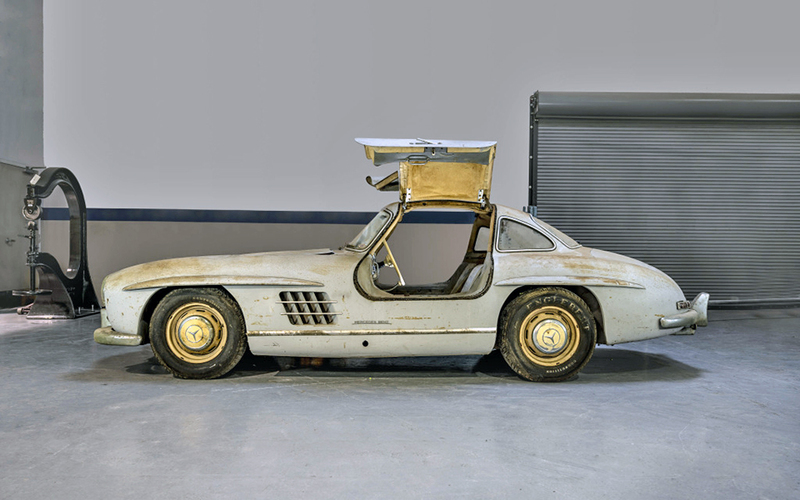 Mercedes Classic Center displayed its 300SL gullwing barnfind at the 2019 edition of the highly respected Amelia Island Concours de Elegance. Mercedes-Benz is always well represented both on the corporate side with the Classic Center displays and on the field. This year saw two Mercedes-centric classes – Mercedes-Benz Post War and Mercedes-Benz 500K-540K – and the Best of Show Concours deElegance came from the 500K-540k class. Arturo Keller’s sleek 1938 Mercedes-Benz 540K Autobahn-Kurier took the top honors. While I wasn’t able to make the show I have to think the 1954 300SL duo that the Classic Center arranged had to be one of the highlights of the show. MBCC rarely touts exciting new project acquisitions and we typically only see them once fully restored and available for sale. They’re a discreet bunch down there in Irvine, CA. 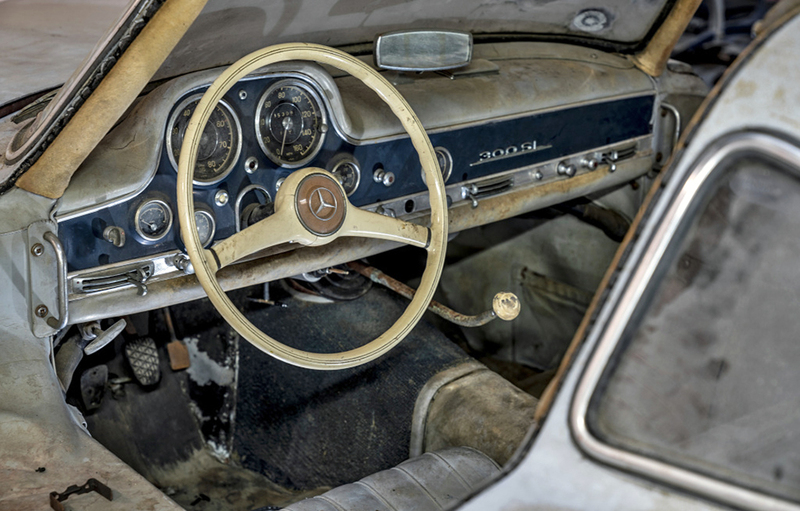 The dream find for any gullwing enthusiast: a complete and unaltered ‘first fifty’ 300SL barn find. We wonder if tools/belly pans and handbooks survived. 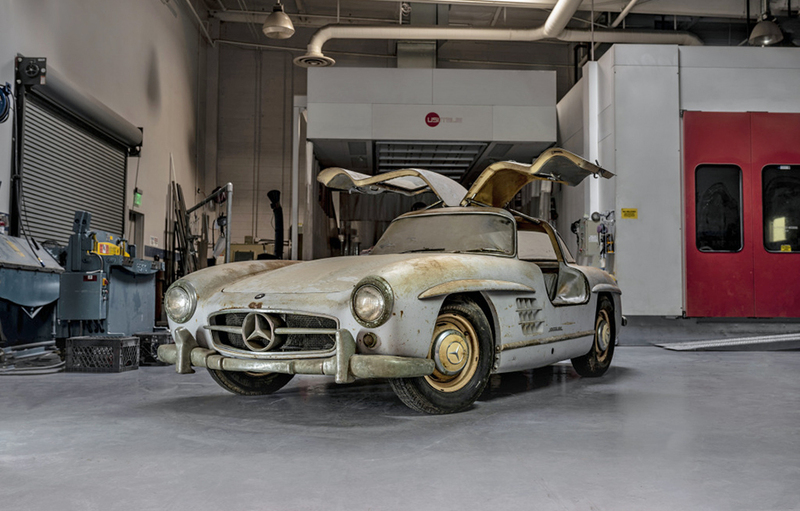 But at Amelia Island this year Mike Kunz and company revealed for all to see a fabulously, or depending on your philosophy toward those who neglect such cars, brutally weathered 1954 300SL they purchased late last year, chassis number 00043. This gullwing was originally delivered to Miami, FL and evidently was registered there for only 10 years or so. My records show that #43 also spent some time in Los Angles but the car eventually made its way back to Florida where it is thought to have been taken off the road in the mid-’60s. Evidently the plan was to paint the car but the process stopped after the original DB350 blue paint was sanded off and the car primed for a respray. And there it sat for some decades languishing in Florida’s moist climate until being given a cozy new home at the Classic Center in Irvine, CA in late 2018. While researching the car the Classic Center learned that they had restored #44 and in a brilliant stroke of showmanship arranged to have both cars displayed side by side. Gloriously tatty, #43’s interior looks to be quite original and we see the long ‘gooseneck’ shift lever, a vestige of the 300 sedan that provided the basis for so much of the early gullwing’s mechanical systems. And we see the suspended throttle pedal, also lifted from the 300 sedan, and changed to a floor mounted pedal beginning with 1955 300SL #752. Looking at the build data for for the consecutively numbered SLs, we see that #43 was in fact completed seven days after #44 on October 28, 1954 and shipped to New York over two weeks after #44. Only 166 gullwings were constructed in 1954 and the first 50 units were fitted with what became known as the gooseneck shift lever to reach under the dashboard to the gearbox housing. This design was carried over from the car whose mechanical features formed the basis of the 300SL, the 300 sedan, also known as the Adenauer. Many of the first 50 gullwings have been retrofitted with the more attractive and precise remote lever configuration. There is some cache surrounding such an early SL because these early cars were fitted with other details that would would soon disappear such as the stylish ‘concave’ grille star and the welting that separated the wheel arch eyebrows from the coachwork. I have a feeling #43 will emerge from the Classic Center meticulously restored to the exact specification the car carried when it was hoisted aboard the cargo ship bound for New York on November 16, 1954. Can’t wait to see it.